Willie Lump Lump and the Mongoose – A cute joke from the old “Red Skelton Show” Many years ago, Red Skelton told the following joke using his inebriate character, Willie Lump Lump. I’ve never seen anyone so high-strung! A joke from the old Red Skelton radio show Rod: I’ve never seen anyone so high-strung! 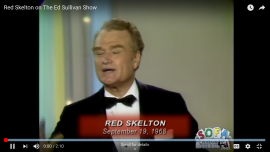 Red Skelton: You should have seen my grandfather. Texas jokes by Red Skelton – Jokes about Texas, as told by Red Skelton impersonator, Brian Hoffman Red Skelton: Is there anyone here from Texas? Yeah?! You can always tell a Texan, … not much, but you can tell em.